We’ve been going through some transitions over here at Art of Massage Chicago. Please note that our old number has been disconnected effective August 17, 2015. You can now contact each therapist via their individual cell numbers listed here. We apologize for any confusion or inconvenience. I hope everyone is having a great summer so far. Just a quick not to let you know that I will be on vacation beginning June 25 and will return to the office on Monday, July 6. I will not be checking email or voicemail during that time. My colleague, Angelita, will be available while I am away. She may add additional office hours in my absence (in addition to her Saturday and Sunday availability). If you want to book an appointment with Angelita (or a future appointment with me), you can do so online. Just click the BOOK NOW button to the right. You can also contact her at 773-981-9090, extension 2. As always, thanks for your business. I look forward to connecting with you after the July 4th holiday weekend. 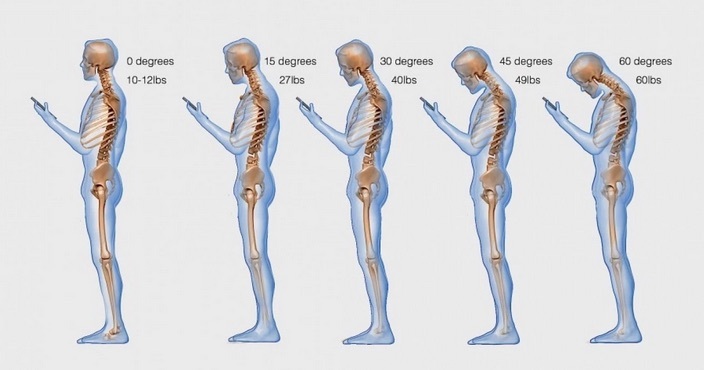 Are you Suffering From “Text Neck”? Just a quick reminder: We do have available appointments this weekend. Just a few slots remain for Saturday (5/23) and Sunday (5/24). If you’re in town this Memorial Day weekend, make sure you treat yourself to some R&R&M – Rest, Relaxation and Massage! Book online or give us a call at 773-981-9090.